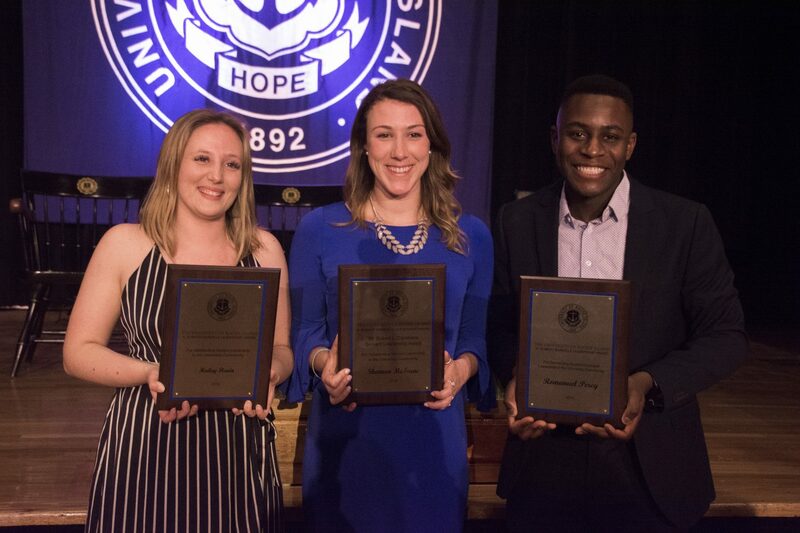 The Memorial Union ballroom was filled with hundreds of members of the University of Rhode Island community on April 10, honoring recipients of the A. Robert Rainville Student Leadership Awards. Maureen McDermott, assistant director of Student Involvement, and President Dooley opened the festivities before many speeches were given in recognition of outstanding achievements throughout the night. Consideration for an award is based upon nomination each fall, followed by an intensive interview process leading to the committee selecting the winner. In total, the four categories for selection included employee excellence, team excellence, student servant and student leadership. 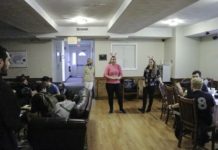 Qualities a nominee may have range from bridging connections across campus to raising money for a cause to serving the community. Next, the finalist for team excellence was chosen following a presentation of the finalists. 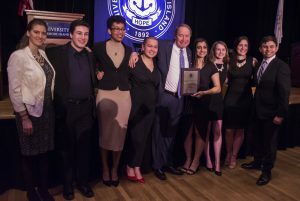 Thrive came out as the winner, with the committee highlighting their excellence in supporting student ideas, stirring social change and empowering one another. I-Stand, Student Entertainment Committee and the Good Five Cent Cigar were selected as the other finalists in the award. “Service above self,” was the motto for the servant leadership category and was echoed in the thank you speech of recipient Shannon McIsaac. These individuals have leaped out of their comfort zone and embarked on their life’s journey. “Step out of your comfort zone…go on your adventure, even if it terrifies you,” said Nicole Schwab during her speech respecting Patricia Graziose, both finalists for this award. The last award of the night was the student leadership award. Throughout presentations, additional attributes were raised honoring friends and fellow students. Importantly, what mattered was the appreciation for student accomplishments and hard work. Everyone comes to the University of Rhode Island yielding a set of experiences, shaping their future based upon what motivates and inspires them. And for the recipient, Hailey Flavin, those experiences were not missed and are leading her to Texas A&M University where she will begin a Master’s program in Student Affairs Administration and Higher Education. Overall, critical attributes for a successful team effort were raised. Particularly, a team should have a strong sense of inclusion, collaboration and be passionately driven. After all, part of the college pathway is to discover what ignites your fire, challenging you to work harder. Add that with being able to work respectfully on a team, and the skill set of a future career is paved out. Whether it’s raising $50,000 during a cancer shaving event or mentoring younger souls, recognition for hard work is warranted.